We only accept Direct Debit. This is usually in reference to academic learning, the sit-down, holding a pencil, writing names and counting to ten kind of learning that most people associate with learning – even in the early years. But what does the research say about it all? Most current and emerging research lends weight to the concept of play-based learning as the primary form of learning for children before eight years of age. This concept is one used by many indigenous cultures across the world but not as widely practiced in countries such as Australia, New Zealand, and the United States. Well, there are all forms of play-based learning and it isn’t a one size fits all kind of approach. It is based on the individual needs of children and considers children’s capabilities and strengths rather than their deficits as often focused on through an academic approach to learning. By using play as the means for learning in the early years, we are setting children up for success when they transition to primary school as well. 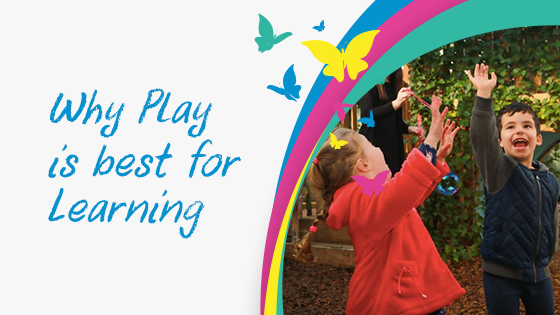 The skills children learn through play are also foundation skills for further learning. Children learn pre-numeracy and literacy skills through play – counting, patterning, sequencing, experimenting, investigating, fine-motor and gross-motor development all happen naturally in the early years if we provide a quality learning environment filled with objects and materials they can manipulate, explore and challenge themselves physically with. Loose parts – Throw away all of those plastic fantastic contraptions. Replace them with open-ended play materials. These are generally a lot more inexpensive than the toys you would buy at Target or Big W. Things like pots, bans, boxes, baskets, wooden pegs, sticks, egg cups, bottle lids, shells etc. are inexpensive but invaluable! Play with children at their level – No one likes to be looked down on, especially children who are just figuring out who they are. Spend a few minutes, down on the floor with your children. Engage them in conversation even if they aren’t yet talking – especially if they aren’t yet talking! Ask them about what they’re playing, making, collecting, changing. Less is more but more or less – instead of having thousands of different toys, try and keep around five different ‘things’ but heaps of them. Wooden pegs are a great example. Get a whole container full and your children will keep busy for hours. You don’t need five different kinds of LEGO for children to be fulfilled in their play – you just have to have enough of the same thing. Make use of the natural world – If you live near a park or a nature reserve or a beach, make sure you go there often. Nature play does great things not only for the brain and the developing body but also for the spirit. Nothing shouts freedom of play more than being in an open field or a moss-covered forest. It is important to understand the difference between learning in the early years and learning in the later years. Learning in the early years sets the stage for how children learn later on. If we encourage a joy for learning, for children to develop a sense of exploration and discovery, then it will pay dividends for children for the rest of their lives.